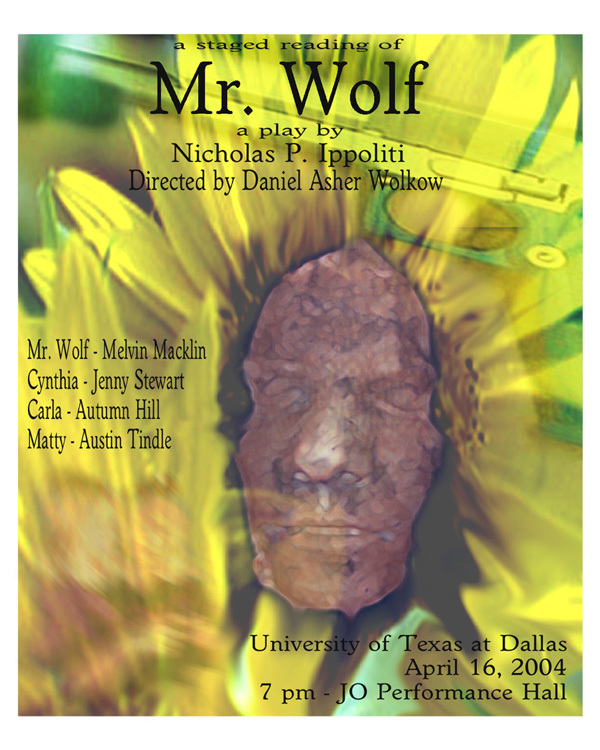 Mr. Wolf met with its first staged reading on April 15, 2004. Under the direction of Daniel Asher Wolkow, the cast of four took the stage of Jonnson Performance Hall, delivering a highly charged presentation of the play's dialogue. Set in a hotel room, a young girl named Cynthia, must make the decision to run from her mistakes or stay to face the consequences. Her affinity for Mr. Wolf, a man of 50, causes her to hold him at gun point; placing him at the center of her decision. Wisdom goes up against unrestained energy in this provocative look at society's willingness to accept violence and its consequent dismantling trust in our elders' ability to lead the younger generation into a future of democracy. Staged readings are the first step toward full productions. Gary Swaim, Thomas Riccio have both offered valuable insight as to how highten the play's internal dialogue and subtext. This summer, under the direction of Kelly Gordon, Mr. Wolf will undergo revisions and a full production is soon to follow. Swaim, Riccio and Gordon all hold positions in the Theatre Department at UTD. Many thanks to the actors; Melvin Macklin, Jenni Stewart, Austin Tindle and Amber Hill for their efforts in making Mr. Wolf come to life.